The federal government may be on the verge of a shutdown, with ‘unprecedented implications’ for new drug reviews, as our friends at Prevision Policy in D.C. put it in a note on Sept. 27. 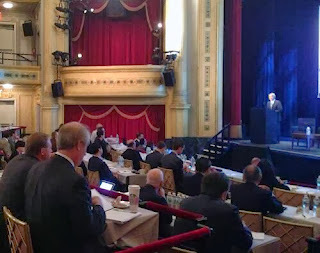 But in New York, the overall mood among investors and industry stakeholders attending Elsevier Business Intelligence’s 23rd annual PSA: The Pharmaceutical Strategy Conference last week was uncharacteristically and surprisingly upbeat. Surprisingly, because anyone who has been involved with pharma for even a little a while has heard investors of all stripes rail against FDA, EMA and regulatory agencies in general as a chief contributor to industry’s malaise. Yet, industry experts at PSA were gushy about both FDA and the general state of R&D creativity. Pharma’s R&D woes are well known – but they are on the scale of “fevers and chills and aches,” said McKinsey director Ajay Dhankhar, who opened the meeting on Sept. 24 with a talk on the “new math of innovation” – not death rattles. Better than breaking down the R&D model and starting over at the core, as some have claimed necessary, he suggested that the industry needs to engage in “punctuated evolution” – in which it experiments in a few areas and takes big leaps. In other words, he argued, minor improvements in multiple areas could add up to big enough swings in productivity, which can put industry on solid footing and allow for the kind of leaps forward that result in longer-term, larger improvements in growth. The IPO bull market obviously colors perceptions, but some of the leading institutional investors, empaneled to discuss investor perceptions on Sept. 24, even had praise for the much-maligned FDA and in particular agency commissioner Janet Woodcock. The quality of communication between FDA and companies has improved significantly, noted RA Capital’s Rajeev Shah, with the agency becoming more predictable, a change that is critical to investors. Speaking of the bull market, investors agreed fundamentals remain strong. The key market catalysts to watch, they said, are the performances of the “big four” biotechs: Biogen Idec, Amgen, Gilead Sciences., and Celgene. At the other end of the investor spectrum, venture capitalists are also optimistic, a tone that VC panelists conveyed at PSA and one that is supported by more substantial quantitative, albeit nuanced, data compiled by our sister publication START-UP in its September 2013 issue. Even opportunities in fraud-investigation-rattled China came in for kind words, despite the wave of publicity about big pharma’s compliance problems there. Heads of three Chinese companies that have commercial deals with Western pharma to sell innovative drugs in China argued that market remains a great growth story, with plenty of opportunity, in light of the ongoing health reform initiatives there. Compliance woes for some are good news for others, and while “at the moment there is a lot of focus on this, fundamentally, it will not change the attractive situation in China for the pharma industry,” said Friedhelm Blobel, CEO of SciClone Inc., a U.S.-Chinese hybrid company that partners with Western companies seeking to sell their drugs in China. For those interested in more on China, attend Elsevier's upcoming PharmAsia Shanghai Summit in October. AbbVie/Galapagos: AbbVie had a busy week, announcing its second drug-development collaboration in as many days on Sept. 24. The new deal is an alliance to develop cystic fibrosis therapies with Galapagos, marking the second tie-up between the companies in two years. The deal extends from discovery through registration, with a goal of improving upon competitor Vertex's nascent success in addressing the root causes of the disease with small-molecule drugs. Vertex has investigated compounds that mediate mutations in the cystic fibrosis transmembrane regulator (CFTR) protein. That company made a big splash with CFTR potentiator Kalydeco (ivacaftor), a channel-opening drug that addresses the G551D mutation in CF patients, when it obtained FDA and EU approval last year. Ablynx/Merck Serono/AbbVie: Drug-discovery company Ablynx had a good week, unveiling two R&D alliances with key big pharma clients that could lead to novel Nanobody pipeline assets. On Sept. 23, the Belgian biotech unveiled a global license pact with AbbVie to develop and commercialize the anti-IL-6R Nanobody ALX-0061 to treat inflammatory diseases. Two days later, Ablynx and Merck Serono announced a multi-year research alliance that could lead to at least four co-discovery and co-development collaborations and bind the Belgium-based Nanobody specialist closer to the German drug maker. Under their latest pact the biopharma division of Germany’s family-controlled Merck KGAA will fund a discovery group at Ablynx numbering up to 30 people, and the two will select disease targets jointly. The team will seek to identify Nanobodies to tackle these during a four-year alliance. Merck Serono will provide €25 million ($33.8 million) in funding over the first four years, including an initial payment of €11.5 million, with an option to extend the alliance a further two-and-a-half years if it’s successful. The Nanobodies R&D pact is that duo’s fourth. Servier/Egis: Being the first company in Europe to bring a biosimilar monoclonal antibody – infliximab – to the market could very well have provided the spark to bring to an end the 18-year arm's-length relationship between the Hungarian generics company Egis Pharmaceuticals and its majority shareholder, the private French company Servier. Servier has offered 28,000 Hungarian forints, or around $125, a share for the 49% of Hungary’s Egis that it does not own, the privately owned French company announced Sept. 24. Egis no longer needs a listing on the Budapest Stock Exchange to raise funds, Servier said, suggesting the buyout was a tidying-up exercise. But with Egis’ sales revenues currently rather flat because of regulatory and reimbursement changes in Hungary and other countries in Central and Eastern Europe, and a growing appreciation of the future sales potential of the biosimilar infliximab product, Servier’s move appears well-timed. Allergan/Medy-Tox: The maker of Botox is defending its position as the market leader in the neuro modulator space with a global licensing deal – excluding Korea – with Korean pharmaceutical company Medy-Tox. Allergan agreed to pay $65 million upfront, $116.5 million in potential development milestone payments and $180.5 million in commercial milestones, as well as royalty payments for the right to develop and commercialize neurotoxin product candidates, including a liquid injectable. CRT Pioneer Fund/Bacit/Sareum: A co-funding pact to develop a novel class of cancer drugs called CHK1 inhibitors was announced in Britain this week by Cancer Research Technology Pioneer Fund and London-listed BACIT Limited and oncology drug discovery specialists Sareum Holdings. CHK1 inhibitors control a cancer cell’s response to DNA damage. Blocking CHK1 could boost the efficacy of chemotherapy drugs by blocking repair of the DNA damage caused by these drugs, but without harming healthy cells. It’s hoped the candidate CHK1 inhibitor potentially could treat a range of cancers including pancreatic, bowel and non-small cell lung cancer in combination with DNA-damaging chemotherapy drugs and radiotherapy. The inhibitor also potentially could treat certain neuroblastoma and acute myeloid leukemia types when dosed alone. The candidate inhibitor originates from research in the Cancer Research UK Cancer Therapeutics Unit at London’s Institute of Cancer Research (ICR) by scientists funded by Cancer Research UK – the world’s largest charity - working alongside Sareum researchers and in collaboration with Cancer Research Technology (CRT), which is the commercial arm of Cancer Research UK. Much of the further work funded by the new investment, announced Sept. 24, will be carried out at The Institute of Cancer Research. The drug candidate is expected to be taken into clinical development at The Royal Marsden NHS Foundation Trust. Rights to the preclinical program have been licensed into Cancer Research Technology Pioneer Fund from CRT and the ICR. Under the terms of the deal, CPF obtains worldwide rights to the preclinical CHK1 inhibitor program and is responsible, for future development and commercialization, funded by CPF, BACIT and Sareum. CRT and the originating research partners, Sareum and the ICR, are entitled to an upfront fee plus success milestone and royalty payments. Financial terms of the license are not disclosed. As part of the agreement Sareum said it expects to commit up to £800,000 ($1.3 million) to the program in its current financial year. The partners say the overall funding will enable the project to move quickly towards, and potentially into Phase I clinical trials, and the successful outcome should allow for the further development and commercialization of a novel and broadly applicable cancer treatment. The CRT Pioneer Fund is a £50 million ($80.4 million) fund that has been established with Cancer Research Technology and the European Investment Fund to bridge the investment gap between cancer drug discovery and early development. BACIT Limited is a self-managed, closed-ended investment company listed on the London Stock Exchange. Sareum, headquartered in Cambridge U.K., produces targeted small-molecule therapeutics, focusing on cancer and auto-immune disease. - S.S.